"Ruby Belle" is the name of this cowgirl's Western boot. Designers took a neutral look and upstaged it with touches of color for your daughter. Leather and True Timber Camo upper with a good rubber riding sole. Just a touch of scalloped pink borders on True Timber Camo in just the right places. Pink Piping completes your fashion. 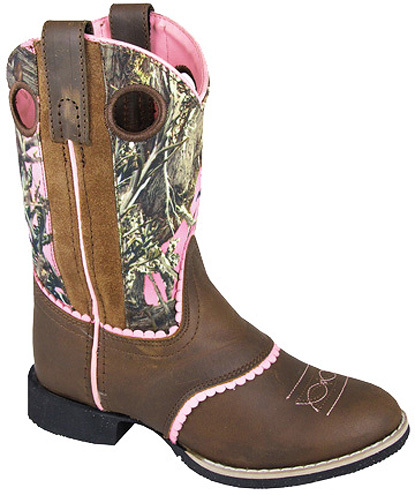 DESCRIPTION: BROWN /PINK CAMO WESTERN BOOT with Pink Trim.